Put the cauliflower and pineapple on a rimmed baking sheet and toss with the olive oil, taco seasoning and salt. Arrange in an even layer and roast for 20-30 minutes, until cauliflower is fork-tender and nicely charred. Taste and adjust the the seasoning. Heat a tortilla in a pan over medium-high heat or by placing it directly on the burner over medium-low heat for 20-30 seconds on each side, until lightly browned. Use tongs to flip. 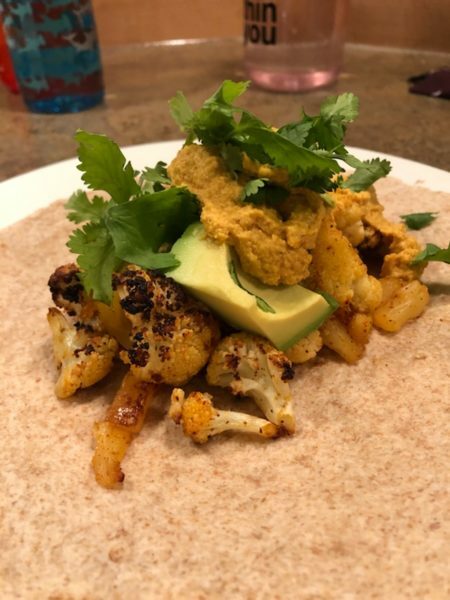 Layer on some of the cauliflower, cashew quest, pickle onions, and avocado. Garnish with cilantro and serve with lime wedges. In a blender, combine all the ingredients and blend until smooth. Fans fee to a small saucepan and stir over medium-low heat for about 5 minutes, until warmed through and thickened.